Madeleine de Repentigny’s Votive Lamp. Maison Armand Caillat, Lyon. As the story goes, soon being admitted to the Monastery in 1717, Marie-Jeanne-Madeleine Legardeur de Repentigny prayed to Our Lady of Great Power to give her the strength to resist the temptation to renounce her vocation. If her prayers were answered, she promised the Virgin Mary that she would light a lamp that would not be extinguished in the exact place where she prayed. Her brother contributed 300 livres pounds to ensure the lamp would remain lit day and night. 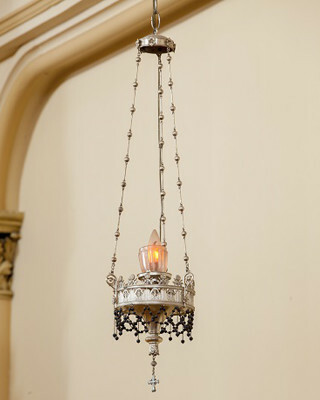 Later, in 1903, one of Mlle de Repentigny’s distant cousins donated the current lamp to the congregation. But you can imagine what could happen to a flame that must never go out. For this reason, the candle was eventually replaced with an electric bulb in 1948! Our congregation has been dedicated to keeping this promise for 300 years.